Romney Renews Attack On Gingrich Over His Role At Freddie Mac : It's All Politics Newt Gingrich is under attack by his rival GOP presidential candidate Mitt Romney for his consulting role at mortgage firm Freddie Mac. Romney, campaigning in Florida, is calling on the former House speaker to release his contract with Freddie Mac. Newt Gingrich is refuting new attacks about his role at mortgage giant Freddie Mac. 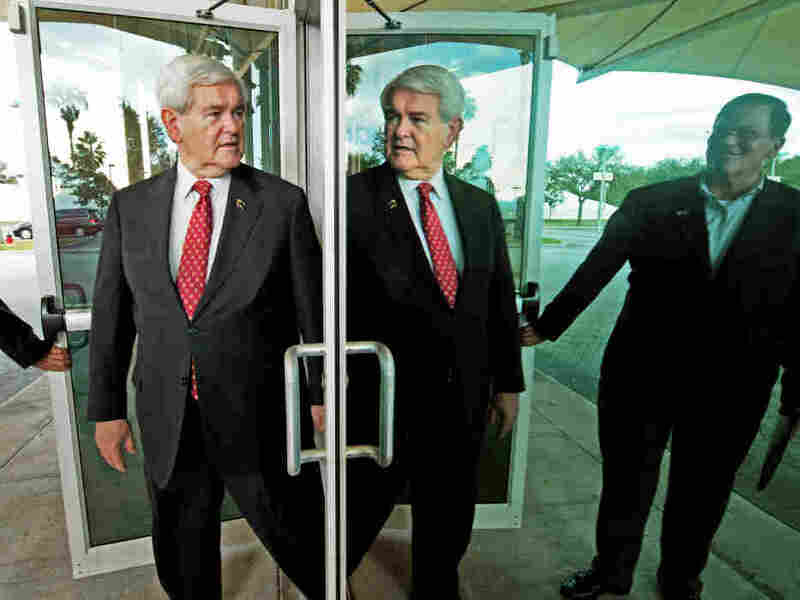 Gingrich's reflection is seen here as he walks out mirrored doors in Tampa, Fla. to deliver remarks and greet supporters on Jan. 23. It didn't take Mitt Romney long to come out swinging in Florida after his stinging defeat in this weekend's South Carolina primary. At a news conference in Florida, which holds the nation's next contest on Jan. 31, Romney called former House Speaker Newt Gingrich "erratic" and said his work for government-backed mortgage firm Freddie Mac could haunt the GOP in the form of "October surprises." Romney called on the former House speaker to release records relating to the $1.6 million he received in consulting fees for Freddie Mac. "As you look at the speaker's record over time, it's been highly erratic," Romney said. "He's gone from pillar to post almost like a pinball machine, from item to item in a way which is highly erratic and does not suggest a stable, thoughtful course which is normally associated with leadership." Romney's campaign released a new television ad attacking Newt Gingrich's role at Freddie Mac. The New York Times reports on the battle shaping up this week between the two GOP rivals with Romney attacking Gingrich as an "erratic" lawmaker. Gingrich, meanwhile appeared Monday morning on ABC's Good Morning America telling George Stephanopoulos he has asked his former company, Center for Health Transformation, to release his consulting contract with Freddie Mac before Florida's Jan. 31 primary. That could come as early as Monday night, perhaps before the 9 p.m. ET debate. Gingrich has said in the past that he was paid by the mortgage giant to offer the firm his "advice as a historian." On Monday afternoon, Gingrich's campaign offered up J.C. Watts, a lobbyist and former congressman to refute attacks that Gingrich was a lobbyist. The Washington Post reports on the media conference call with Watts who lobbied on behalf of financial firms to rewrite the federal regulation governing Freddie Mac. He says during his time lobbying for reform, Gingrich's name never came up. UPDATED 7:15 p.m.: The Center for Health Transformation announced the release of a contract covering Freddie Mac's consulting agreement with Newt Gingrich for 2006. The consulting agreement lists a monthly retainer fee of $25,000 not to exceed $300,000 for the year.